I have not taken Eurostar recently, but judging by comments posted on my previous blog posts about the service, it seems that the security paranoia that afflicts the route has not diminished. Anyway, for the first time in months, I am going to be on Eurostar on Friday this week, and am taking my journey as a little experiment. Right then. My train does stop in Lille Europe, and not in Calais. The next task: can tickets even be booked on this service between Brussels and Lille? I used SNCB’s search to check this, and it only shows trains 9133 (1256 departure), and 9161 (1952 departure) – i.e. it will not let me book Brussels – Lille on train 9157. 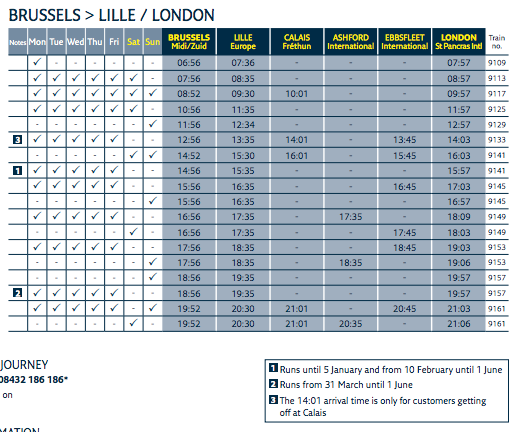 I also checked with the same search on Capitaine Train, and it is even clearer – train 9157 shows up, but the site tells me that booking anything on it for Brussels – Lille is impossible. I have also tried multiple days for my searches, just to make sure that it is not only because one service is full. So train 9157 does not set down any passengers in Lille, it only picks them up, and beyond Lille it does not stop the whole way to St Pancras. This means that the Lille Loophole does not apply to this service (but would apply to trains 9133 and 9161). What does this mean for security checks on board this service? It means that a passport check by the UK Borders Authority in Brussels should suffice, and the same for passengers boarding in Lille. No further checks should be needed on board the train, nor at St Pancras. Let’s see what happens on Friday, because I would be really surprised if that is actually what happens. can i take train from brussels to lille ? is there security check? what if someone want to go by road ,there will be security check? could you please assist me in this part. And the most annoying thing is the UKBA control in London St Pancras Int’l. In February I travelled from the continent to Nottingham and almost missed my connection in St Pancras. Somewhere on Eurostar’s website they do note that there will be an additional control and that one should consider additional 30 minutes for connections. Eurostar did NOT inform Deutsche Bahn so that their timetable database thinks that 15 minutes is enough to make a connection between Eurostar and East Midlands Trains. As a consequence, the effective travel time from Brussels to London is now about 3 hours 15 min and the average speed of Eurostar running on very expensive high-speed lines is as high as the average speed of a 35 year old High Speed Train running on the old Midland Main Line. Why can’t there just be a simple passport check on board the train between Lille and London, like the Helsinki-St. Petersburg line which has a passport check between Vainikkala and Vyborg? The boarder checks at the Finnish-Russian border should be a lot more complex due to the fact that almost all passengers needing a visa to either Finland or Russia and due to the customs border, whereas on the Brussels-London line almost all passengers should be EU citizens who only need a simple passport check and no customs check. What the free market lovers (or should I say fundamentalists) of the UK political establishment don’t tell you, or rather don’t know (because they don’t teach that in Oxbridge) is that the single market is meant to be “an area WITHOUT INTERNAL FRONTIERS in which the FREE MOVEMENT of PERSONS* is ensured”. *Persons means persons, not ‘certain persons’ as in the UK xenophobic interpretation of this directive. Border controls in the single market are therefore illegal because they are incompatible with the single market, i.e. they interfere with and restrict the movement of certain persons inside the single market. The fact that the UK bullied the rest of the EU to give it an opt-out doesn’t take an iota out of this fact. It’s very simple, for the UK to grow up and join Schengen. But no, has anybody found a cure yet for OBCD (Obsessive Border Control Disorder)? Is the Lille loophole even real, i.e. can you get on the train in Brussels holding a Brussels-Lille ticket without going through a passport check? Last I recall everyone went through the same entrance and through 2x passport controls (Schengen exit, UK entry) in the Brussels train station. At their checkpoint, does the UKBA seemly have to wave people through without checks if they only hold a Brussels-Lille ticket? Seems too daft to be real. @Rahul – yes it is, as far as I am aware. After the Belgian passport check in Gare du Midi, and before the bag scanners and the UKBA check, there is a little corridor off to the left for Lille passengers. But I have never done it, so cannot vouch for what checks (if any) are performed. @Simon – does it matter which train you are on? Or is it random?